A few weeks ago, I got to photograph this family at Cragg Vale, Yorkshire, while on the Capturing Childhood retreat. The creative photography retreat was run by Sarah Mason and Suzi Garlick, the duo behind Sarah Mason Photography. It was a wonderful experience that I shared with a small group of like-minded photographers, who were there to learn from Sarah about making photos of real moments and the skills that went along with it as well. I will be writing more about my experience from this retreat in a separate post, but I wanted to share some photographs I took during this family photo shoot with a mother and her two young toddler-aged children. 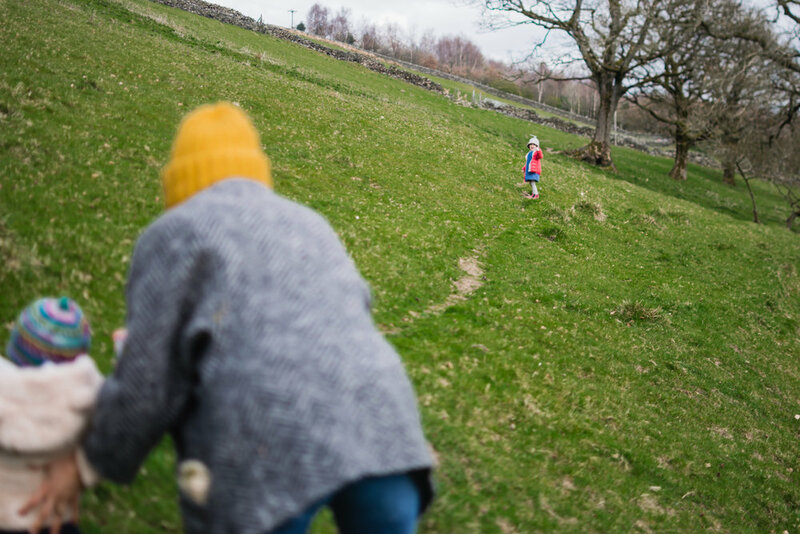 I have been wanting to do more freelensing with other families and took the opportunity to do so during that weekend in Yorkshire. I was fortunate that the mum was very creative and loved photography, and was keen to have some photographs of herself with her children. Also, the moors and woodlands provided a nice backdrop for the outdoor photo shoot. The oldest girl was very playful during the photo shoot, so I knew that creating the freelensing photographs beautifully captured that whimsical feel too. Although, with this creative technique, I can never fully know what I’ll get on my camera until I look back on the computer when I’m editing the images. With a very active toddler and also a younger one who was still learning to walk, this provided a real challenge to my freelensing albeit a very enjoyable one. I was happy with the resulting images and it meant I was able to give the mother a bespoke piece of art to her photographs. Here are a few images from the family photo shoot and you can see more if you visit my portfolio gallery. Visit the next artist in our Free 52 blog circle to the amazing photographer Gwen Athman, to read and see her freelensed images from March. Diana Hagues is a Cambridgeshire photographer near Cambridge who offers family storytelling and day-in-the-life photo sessions that capture the real moments of your daily life to relive your story forever. You can find more details here. For a limited time only, I am offering portfolio family photo shoots all shot through freelensing - prices start from £150. Please get in touch if you are interested in one of these sessions and would like more information via my contact form or email me at hello@dianahaguesphotography.co.uk .